We were alerted last week of a malware outbreak affecting WordPress sites using version 3.0.2 and lower of the fancybox-for-wordpress plugin. As announced, here are some of the details explaining how attackers could use this vulnerability to inject malicious iframes on websites using this plugin. This vulnerability exploited a somewhat well-known attack vector amongst WordPress plugins: unprotected “admin_init” hooks. 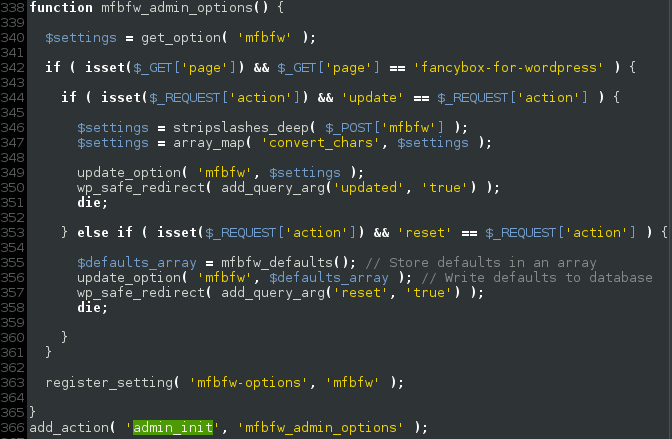 As “admin_init” hooks can be called by anyone visiting either /wp-admin/admin-post.php or /wp-admin/admin-ajax.php, this snippet could be used by remote attackers to change the plugin’s “mfbfw” option with any desired content. This got us asking ourselves, what was this option used for? We found that this option was being used in many places within the plugins codebase. The one that caught our attention was inside the mfbfw_init() function. This basically displays jQuery scripts configured to work with parameters that were set up earlier, in mfbfw_admin_options().